If you know the ins and outs of computer systems you should not really have a problem deciding which applications to keep on your PC and which to remove from it. If you are not that tech savvy, you sometimes may need a little extra help to make up your mind and make a decision. While you probably can come up with the decision for most software installed on your system, you may need advice on some software that found its way on it. That's basically what Should I Remove It has been designed to do. 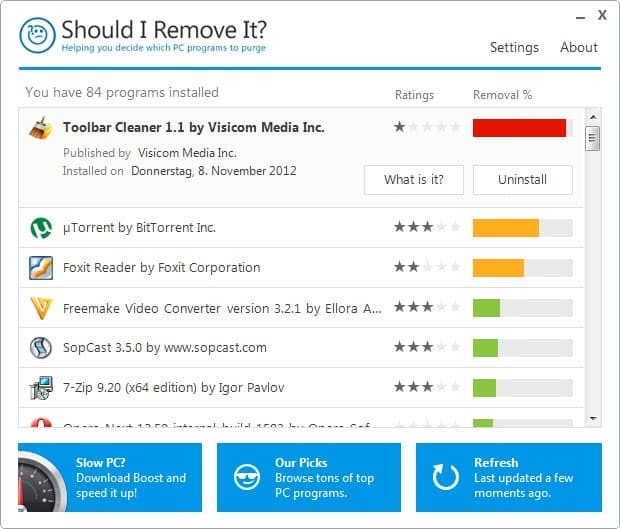 It retrieves the list of installed applications on your PC and displays ratings and removal suggestions in its interface when you start it. The ratings and percentages are accumulated from the collective wisdom of all users of the software program. While that does not necessarily mean that you should trust those blindly, it can help you make a decision if you stumble upon programs that you are not certain about. The program sorts the list of software installed on the Windows PC it is running on based on the removal percentages; the programs that have the highest removal suggestions are listed at the top. Here you see the application's name, publisher and date of installation. When you click on it, you will get a "what is" and uninstall button. Activation of uninstall runs the native uninstaller to remove the program from the system, while the "what is" it button opens a page on the program's website that offers information about the selected program. What's interesting here is that it provides you with important information like whether it is bundled with third party software or if it is making changes to the system, like adding itself to the start up. The page lists information about the program, which version of the program is used the most by users of the service, how to remove it, and where it is located on the system by default. Should I remove It can help you in your decision making process but it is highly recommended not to trust the suggestions blindly. The information provided on the homepage are quite good, especially the warning messages about adware and the behavior section need to be mentioned in this regard. The program could use an integrated update checker to inform its users if new versions of an installed program are available. While you can base your decision exclusively on the program's suggestion, it is usually better to find out more about it before you hit the uninstall button. Tip: you may want to use more thorough uninstallers such as IOBit Uninstaller, Bulk Crap Uninstaller, or Revo Uninstaller as those clean-up leftovers as well. This software is by the same company that makes the pay trialware Boost software. http://www.boostbyreason.com/ I suspect “Should I Remove It” is a limited version of Boost, made purely to promote Boost, as there’s a huge button promoting it in the application, and it’s one of only 4 different recommended programs by “Should I Remove It.” Recommending your own product is fine, but not making it obvious that you’re recommending your own product over all others is misleading for something like this. The safety of the boostbyreason site is contested on its web of trust scorecard: http://www.mywot.com/en/scorecard/boostbyreason.com?utm_source=addon&utm_content=rw-viewsc Recommending “Should I Remove It” then is akin to endorsing Boost, which does a ton of magical handwaving on its explanation page: http://www.boostbyreason.com/features_technical.aspx I didn’t test boost myself, as I don’t trust its blurry explanations as to how it works. It should also intercept installers and give advice on the software you’re about to install. Think “better safe than sorry”. – Percentages are not shown in numbers, only as a partially coloured bar. An option to add portable programs would indeed be handy. So basically, I should uninstall software based on what others are saying? Somehow I find this to be a really bad idea… In my opinion, you should keep or remove software because you need it or because it serves a purpose, not because “the collective wisdom” says so. Well it can sometimes help. If 99% are saying it is bad, it is likely bad. While you still need to make the final decision on your own, you may use the information to make it. So, it can help but only up to a point. Most votes on the other hand are not black or white anyway. Soluto uses the same principle but as far i know only related to programs wich starts with windows.